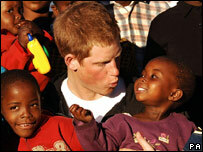 Prince Harry is launching a charity in Lesotho to support children orphaned by Aids, in memory of his mother Diana. In a tribute to the late Princess of Wales, killed in a Paris car crash nine years ago, Harry, 21, will call it Sentebale, which means "forget me not". He has vowed to continue Diana's work in the fight against Aids. The charity, to be run by Clarence House, will be launched at the Mants'ase Children's Home near Mohale's Hoek, in the southern African kingdom. He returned to Lesotho this week for the launch where he was reunited with six-year-old Aids orphan Mutsu Potsane, whom he first met at the children's home two years ago. This is his fourth trip to the kingdom - he visited twice in his gap year and last year met Mutsu privately after his first term at Sandhurst. The Prince co-founded the charity with the country's Prince Seeiso, whose own mother Queen Mamohato died in 2003. "Both our mothers were hugely connected with Aids, especially the orphaned children. "I wanted to carry on as best I could what she [Diana] started and what better place than to do it than here?" he said. He hoped his mother would be proud, he added. Every day about 70 people in Lesotho die from Aids. The charity plans to offer long-term support to small and new projects that might not attract large-scale international funding. "This is our place. We are starting with small projects. Most other charities are concentrating on other areas. There is no one else. It is only us," said Prince Harry. "When you are back in England you just get on with life.... but then you come to a place like this and it makes you realise how lucky you actually are. "When I was here for the first time, I actually found myself thanking the press for the first time - and the last time ever probably - for the amount of awareness they made of this place by putting it in the papers." He also visited the remote rural village of Nokong, in the foothills of the Maluti mountains, to see maize grown by a crop-sharing project to help feed vulnerable children. 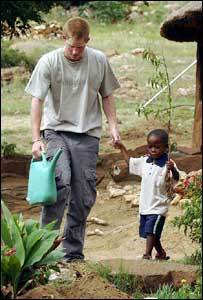 The Red Cross Lesotho Fund, set up as a temporary measure to distribute more than £1m raised after a television documentary Prince Harry made about Lesotho in 2004, has been supporting the orphanage and the crop-sharing scheme. The money also helped fund 18 other projects, including building a storage hut for a child-counselling centre, furnishing a kitchen at a home for teenage mothers and providing a computerised Braille machine for blind teenagers. In the summer, Harry will play a series of polo matches, probably with Prince William, to raise money for Sentebale and he plans to return to Lesotho. "It would be weird not to come back. I am committed for the rest of my life. "Come back to this place in 25 years, you will see a massive difference. You will be surprised."